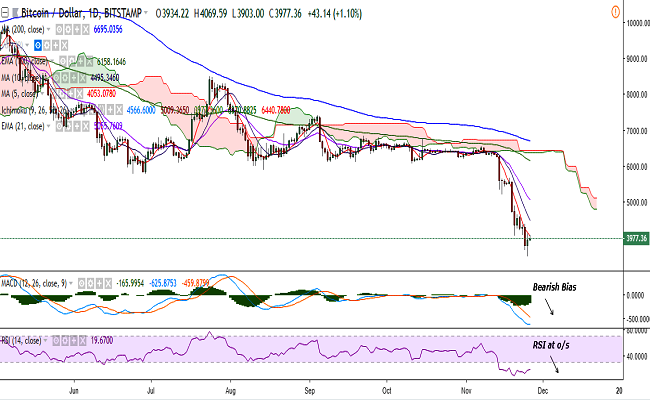 BTC/USD is hovering around $4,000 on Monday (at press time) as it recovered slightly from the fresh 2018-low of $3,474 hit on November 25 (Bitstamp). The pair is trading just shy of $4,065 (5-DMA) and a break above would see it testing $4,141 (1h 100-SMA)/$4,237 (3h 50-SMA). Further strength would target $4,523 (1h 200-SMA)/$4,659 (23.6% retracement of $8,496.96 and $3,474.73). On the downside, support is likely to be found at $3,886 (1h 20-SMA) and any violation would drag it to $3,500/$3,146 (1w 200-SMA)/$3,000. Bias remains bearish on the daily charts with the pair’s upside capped by 5-DMA. MACD also supports further downside in the pair. However, caution is advised as RSI and stochs are at oversold levels. Minor bullishness could be seen on the intraday charts and a close above 5-DMA could see some upside in the pair. Speaking with CoinDesk, Mao Shixing, founder of F2pool, said that his firm has estimated that between 600,000 and 800,000 bitcoin miners have halted their operations since mid-November amid the recent drop in price and hashrate across the network. As to what could have led to these shutdowns, Shixing listed a number of reasons including the recent market downturn, an increase in electricity costs in China, along with Chinese manufacturers trying to upgrade their products, making older mining machines increasingly uncompetitive. However, the recent shut down of mining operations does not necessarily mean that these firms have quit the business completely, CoinDesk explained. When there is a decline in the hashrate, the mining difficulty also drops. “The change of bitcoin’s mining difficulty normally has a lag of about 14 days [following hashrate change]. After this wave of shutdowns, those players who opted to stay in may have a better life,” Shixing said.